In addition to the physical infrastructure, ONC has agreements with other ocean stakeholders related to protection of sensitive data. All data from sensors on the network are normally freely available over the Internet, to anyone. Some of these data have been identified as commercially sensitive, because they record the functioning of new instruments undergoing field-testing on the network by ONC’s commercial partners. Such data are not released until the manufacturer is satisfied with the performance of the new instrument. Other data are sensitive from a national security point of view. A cooperation agreement with the Royal Canadian Navy addresses the issue of acoustic signatures of naval ships and submarines that can be recorded by ONC’s hydrophones and broadband seismometers. 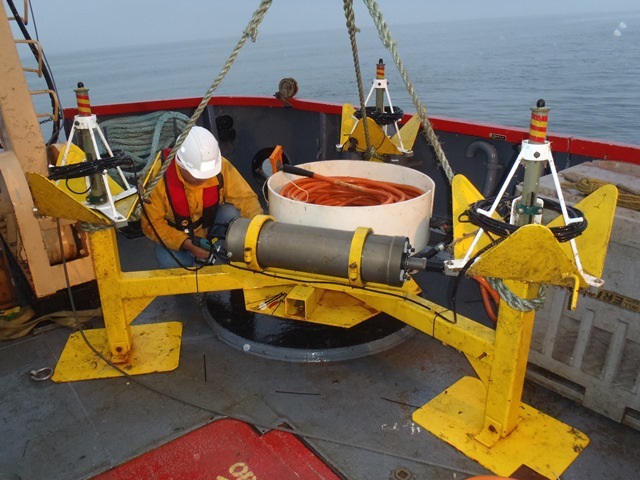 This agreement allows the military to divert data streams from hydrophones and broadband seismometers before data are directed to ONC’s data acquisition and archiving system, Oceans 2.0. These ‘data diverts’ normally occur during the transit of military vessels through the area being monitored by ONC sensors. Diverted data are examined by military technicians, and most are returned directly to ONC within a few days. Data deemed “sensitive” are stored and could eventually become available to researchers upon request. Diverted data are examined by military technicians, and most are returned directly to ONC within a few days. Data deemed “sensitive” are stored and could eventually become available to researchers upon request. The conditions of the agreement with military stakeholders and the latest statistics on data diversion are reviewed twice each year in meetings attended by ONC, and the Canadian and US navies. These meetings are held in a spirit of cooperation, and reasonable and justifiable requests from both sides for modifications to the working arrangement are usually accepted.